Designed as a cornucopia of textured wire with a large rose-cut orange citrine in the terminal, decorated with brilliant-cut diamond detail. The largest private collection of jewels signed Andrew Grima will go under the hammer ad Bonhams, London, on September 20th. The collection will be presented during Bonhams’ Fine Jewellery sale, and it will feature 55 pieces of signed jewellery by Andrew Grima – among which some of his earliest jewels, created in London during the Sixties, and more that span from the 1970s through the Nineties until those released before his death in 2007. Charismatic Anglo-Italian jeweller Andrew Grima was regarded as one of the 20th century’s most daring and imaginative designers. Andrew Grima was a jeweller appreciated by royals, celebrities, socialites and artists throughout the Swinging Sixties and Seventies, with his earliest clients including HM The Queen, The Princess Margaret, Jackie Kennedy Onassis and Ursula Andress. Today, collectors of his work include fashion designers Marc Jacobs and Miuccia Prada. Here is a very interesting video, released by Bonhams, giving a compelling historical retrospective on Andrew Grima and his work. Grima’s groundbreaking designs, which drew inspiration from art, sculpture and the natural world, injected great originality and glamour into what had become a stagnant jewellery scene in post-war Britain. He created bold and unusual jewels whose value lay in their aesthetic composition rather than just in the carat weight of expensive diamonds and precious gems. He is recognised as one of the great modernist jewellery designers of the 20th century and his pieces are highly sought after worldwide. Highlights include pieces from his admired “About Time” watch collection for Omega, one of the most innovative collections of watches ever made, as well as works from the “Rock Revival” collection in that incorporated large, uncut and unusual gemstone crystals. Omega approached Grima in October 1968 to create a series of watches and timepieces, ending up with an original list of 55 watches and 31 matching jewels. The revolution introduced by Grima, and applied to the “About Time” collection for Omega, was in the use of a gemstone as the watch “glass” whereby the wearer would see time through a gem. The collection launches in 1970 in London and within days sold out (with each watch taking a minimum of six weeks to four months to manufacture). 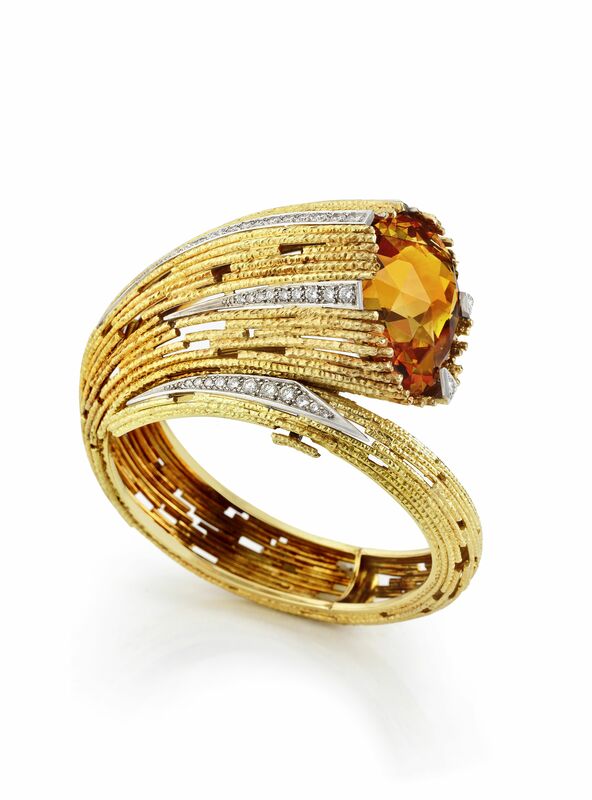 The large, oval-cut citrine ‘glass’, within a bezel composed of a myriad of gold ‘matchsticks’ decorated with baguette-cut diamonds, on a wide ‘matchstick’ bangle. The design was inspired by tiny wax-coated matches – cerini – used in bars throughout Italy. The irregularly shaped pink tourmaline ‘glass’ within an irregularly shaped ‘gritted’ gold bangle. The multi-sided pale green beryl ‘glass’ on a highly articulated strap of irregularly-shaped ‘stepping stones’ of textured matt finish. This model, made in 1972, is similar to the ‘Caribbean’ watch that was No 1 on the original About Time index in 1970. Part of the “Rock Revival” collection, each surmount set with a hexagonal amethyst crystal, within a border of scattered gold triangles of matt finish and a single brilliant-cut diamond, suspending a detachable pendant of similar design, mounted in 18 carat yellow gold. Part of the “Sticks and Stones” collection, the pendant composed of a large green dioptase crystal, within a ‘scattered’ border of overlapping gold squares of matt and textured finish, with eight square-cut diamond highlights, mounted in 18 carat yellow gold. The cushion-shaped amethyst surrounded by ‘stalks’ of varying heights inset with step-cut emeralds and square-cut diamonds, mounted in engraved yellow gold, with additional brilliant-cut diamond detail at the shoulders. The large, step-cut citrine within a mount of undulating ‘textured wire’ with single-cut diamond highlight, mounted in yellow gold. About this stunning necklace: Andrew Grima’s engineering background and imagination led him to invent this unique way of creating jewellery using gold textured wire, a technique that today is widely known as Grima’s signature design. This technique allowed him to achieve a sense of lightness and movement. At first appearing to be rigid in design, its thousands of wires and hidden hinges, gave the necklace the flexibility to embrace the wearer. Achieving this result required unique skills which only a handful of goldsmiths mastered. Each wire had to be soldered to the next and numerous hinges were then discreetly integrated into the back. This brooch of real pencil shavings were formed as a rosette and then cast in yellow gold and scattered with brilliant-cut diamonds. scatterings of brilliant-cut diamond snow, suspended from a textured torque. Opals were one of Andrew Grima’s favourite stones and feature in a number of his pieces throughout his career. The highly articulated bib composed of triangular-cut citrines and smaller similarly-cut diamonds, mounted in yellow gold, with hidden triangular snap clasp, mounted in 18 carat yellow gold. Composed of two articulated ‘textured wire’ clusters, each set with a large pear-shaped pink tourmaline within a border of pear-shaped emeralds and scattered with brilliant-cut diamonds, one fancy-cut diamond at the apex, mounted in 18 carat yellow gold, suspended from a later torque necklace of matt and engraved finish to resemble a wide ribbon of golden threads. By looking at his exceptional creations, it is easy to understand how, today, Andrew Grima is recognised as one of the great modernist jewellery designers of the 20th century; perhaps the most influential of the post-war period. All material courtesy of Bonhams Press Office.